Sorbitol 70%, sodium benzoate, citric acid monohydrate, tutti fruitti flavour, purified water. – Sedobroxol is a systemically active mucoly1ic agent. – Following oral administration, onset of action occurs after about 30 minutes. – the breakdown of acid mucopolysaccharide fibers makes the sputum thinner and less viscous and therefore more easily removed by coughing. – Although sputum volume eventually decreases, its viscosity remains low for as long as treatment is maintained. During acute exacerabations of bronchitis, Sedobroxol should be given with the appropriate antibiotic. Patients with hypersensitivity to the active ingredient (ambroxol hydrochloride), or to bromhexine, orto any ofthe ingredients in the formulation. Occasional mild gastro-intestinal irritation and discomfort (e.g. Diarrhea, abdominal fullness, and nausea). Allergic reactions, primarily skin rashes, occur rarely. – Relative caution should be observed in patients with history of gastric or peptic ulceration. – Use of Sedobroxol therapy is not recommended during the first trimester of pregnancy and breast-feeding mothers. 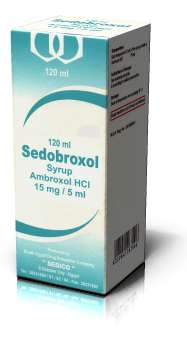 Sedobroxol should be administered immediately after meals. 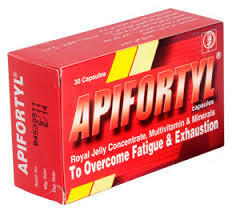 10 ml (two teaspoonfuls), to be administered 3 times daily. Children 7-12 years old: 5 ml (one teaspoonful) 2-3 times daily. Children 3 -6 years old : 2.5 ml (half a teaspoonful) 3 times daily. Children 1-2 years old : 2.5 ml (half a teaspoonful) twice daily. Antibiotic concentrations (arnoxicillin, cefuroxime, and erythromycin) in bronchopulmonary secretions and in the sputum are increased with concomitant administration of Sedobroxol . -.Keep at temperature not exceeding 30′ C.
– Keep out of reach and sight of children. Carton box containing amber glass bottle of 60 ml or 120 ml of syrup solution closed with aluminum cap and with insert leaflet.